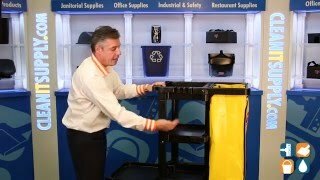 Helping to improve efficiency with its innovative features, the Rubbermaid Commercial Multi-Shelf Janitorial Cart was designed with increased storage capacity, three shelves for supplies, hooks for mop and broom handles and dust pans. 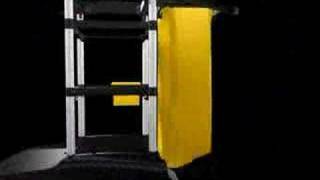 Constructed of reinforced, smooth-walled plastic with rounded edges, this cart will not damage walls or doorways. The non-marring 4” swivel casters and 8” diameter real wheels make maneuvering this cleaning cart a breeze. A durable frame keeps the 25-gallon vinyl bag securely attached to the handle. The platform is strong enough to hold a 32-gallon container or standard-sized mop bucket. 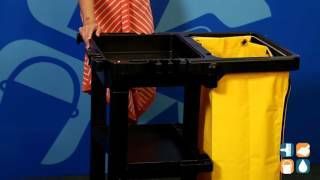 The Rubbermaid cleaning cart is an excellent choice for cleaning professionals, janitorial services and custodians for use in office buildings, schools, hospitals, nursing homes, daycare centers and more. Dimensions: 21-3/4"W x 46"L x 38-3/8"H.
Slammin' good quality. Lots of space. It's gonna last for the long haul, no doubt. Wheels around like a dream. 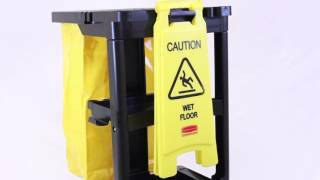 Don't waste your money and efforts on any other janitor's cart. This is THE ONE. this product holds everything so you cut down on trips to get supplies etc. The product works well. The price was fair.